OURMALA is an organization dedicated to providing immediate and lasting change for refugees and asylum-seekers through therapeutic care, educational services and access to critical resources. OURMALA exists to help refugees and asylum-seekers recover from the atrocities they have experienced and rebuild their lives. To protect identity, all names here have been changed. Case studies 1 - 6 were kindly written-up on a pro bono basis by volunteer Clêr Lewis in 2018 based on a series of 1- 2-1 interviews that had been conducted over the course of 2017 as part of a major impact measurement project. Case studies 7 - 8 were kindly written-up on a pro bono basis by volunteer Amber Collinge and these short case studies are based on a BBC Radio 4 Woman’s Hour interview with women beneficiaries in September 2017. Ages, country of origin and how long they’ve been attending OURMALA were not recorded in this interview. You can listen to this interview HERE. The OURMALA interview starts about half way in. In time, Arta also discovered that her mental stress and anxiety had decreased and she started to worry less about things. She sometimes uses the breathing practices in her everyday life and she feels her yoga practice helps give her a sense of control, which is so important given her prior experience of lacking all autonomy over her body and life. ‘(Yoga) is good for your body and for your mind too. It works in both ways.’ Her young daughter also enjoys yoga, so it has given them a healthy activity to share and explore together. More recently, Arta has developed a painful condition called Fibromyalgia, which leaves her in a great deal of physical pain. On some days, she finds herself unable to rest comfortably in either a standing or sitting position. Thankfully she has been able to find some relief through a sequence of yoga postures, which have been designed specifically for her by one of the OURMALA teachers. Adaeze is a 38-year-old woman from Nigeria, who is an asylum seeker and victim of sexual trafficking. She has been attending the trauma-informed yoga classes at OURMALA for just under twelve months. She dreams of one day returning to her studies to train in the nursing or hospitality industries. Fatima is a 50-year-old woman from Eritrea. She is a refugee who has survived torture. She has been attending the trauma-informed yoga classes for over 1.5 years. In addition, she has found the yoga classes give her a sense of calm and relaxation. Her confidence has improved immeasurably: ‘...before I am shy, I’m not talking. I not make friends quickly but now it is easy for me. Big change.’ She is sleeping much better and the dosage of her antidepressant medication was reduced by her doctor. She often practices her yoga at home, especially when suffering a bout of insomnia and she finds the postures and breathing help to settle her. Jaleh s a 30-year-old Iranian woman. She has been attending the trauma-informed yoga classes with OURMALA for 1.5 years, throughout her asylum-seeking process and she has recently been granted refugee status. Before attending the classes she experienced weakness in her legs but she has discovered that yoga has helped her balance improve immeasurably. She now enjoys a standing pose called Vrksasana, or Tree pose, in which you stand strongly on one leg, rooting into the earth, with the other foot positioned against the thigh of the standing leg. She also enjoys Tadasana, or Mountain pose, in which you stand tall, feeling your feet connect deeply with the ground beneath. She feels these poses give her increased confidence and help her feel strong. Other benefits of yoga she has discovered include an improvement in her sleep and she likes to recreate the feeling at home when she is trying to fall asleep. ‘I feel like I am on a yoga mattress... and then I fall asleep.’ Her ga practice has helped her release tension and anxiety and has brought her a sense of calm. ‘Feeling calm means my mind is more relaxed, more open, because before that my mind is so tight...trapped, like a cage.’ In addition, she has found her appetite has improved and she has made lots of friends in the group, many of whom she meets up with outside of the class. This sense of community and shared experience is extremely important to her. Maria is the mother of a beautiful 4 year old girl from Albania. Maria has been attending the Happy Baby Community since it started in 2013. When Maria first started attending she was struggling with debilitating anxiety, flashbacks and depression. Through regularly participating on our yoga classes and with the support of the group volunteers and other mums, Maria tells us that she is able to take her mind off the other challenges she faces as a single mom as well as an asylum seeker. Maria is a confident and brave parent, and now supports other new mums in the group who are facing similar challenges. Susan was referred to the Happy Baby Community when she learned that she was expecting her first child. Susan is a refugee who has suffered unimaginable abuse and violence. Before becoming pregnant, Susan was suffering with post-traumatic stress disorder symptoms such as anxiety and nightmares. During her first trimester, Susan was terrified and felt completely alone. Susan was welcomed to the Happy Baby Community, she quickly formed friendships with other mothers in the group. Susan also worked with our team where she was provided with support and guidance throughout or pregnancy. Susan continues to attend the group almost every week, where she participates in yoga, English classes while accessing GP, welfare and therapy support. Susan and her children are building a happy and healthy life in the UK with the support of the Happy Baby Community. Click here to learn more about OURMALA! 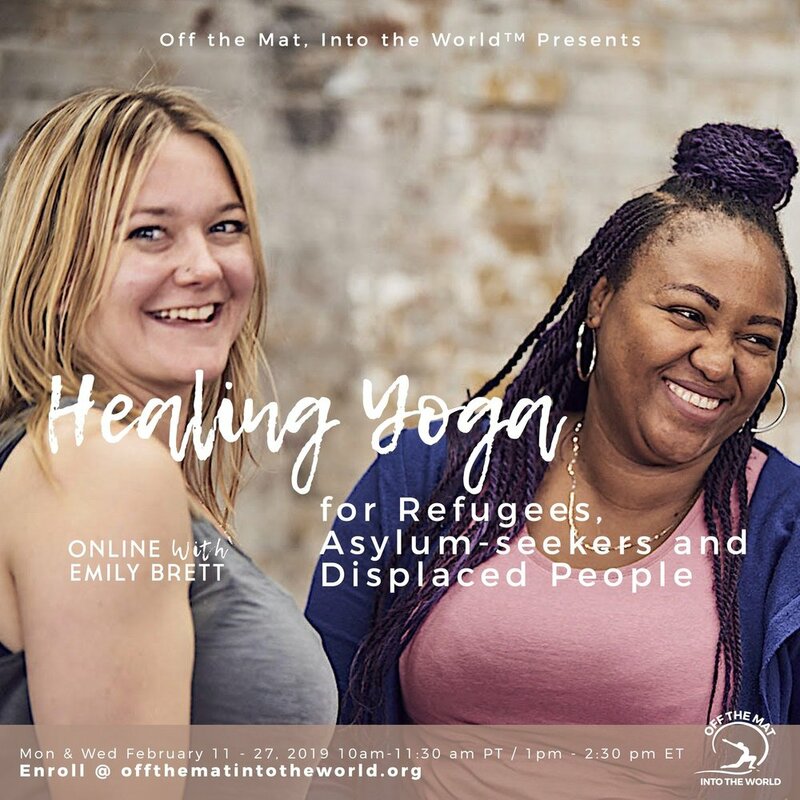 Off the Mat, Into the World is so honored to be offering this upcoming 6-session course beginning on February 11th with Emily Brett and OURMALA, “Healing Yoga for Refugees, Asylum-seekers and Displaced People." Learn how each of us can offer peace through yoga to refugees, asylum seekers, and under-served groups. You don't have to have a yoga teacher training to participate. If you are interested, whoever you are, you are more than welcome. Have confidence, take the step, come on the training and see where it leads you!